Shiva (Vijay Deverakonda) buys an Old Car hoping to earn big income as a Cab Driver. But the car is possessed by a spirit. How he manages to find out the story behind the Car and frees the spirit forms the rest. Vijay shines in the 1st Half and holds the film together. Malavika Nair is good in a crucial role and Priyanka is ordinary. Madhunandan, Sijju and other supporting cast are adequate. Music: Okay. All Songs are situational. Action : Limited and Okay. 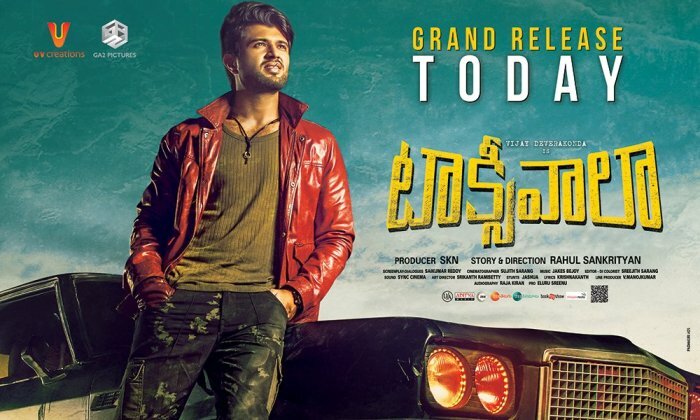 Taxiwaala is a Super Natural Drama which provides enough entertainment. The 1st half of the film is especially good and 2nd half is a little dragged affair and is average. It rides on a new concept of `Astral Projection` and thus is a Largely Engaging Watch despite its share of flaws. A Worthy conclusion would have made this an even better film. Nevertheless, this still has enough in it to command a Visit to your nearest theater. Box-office Verdict : Decent Reports and Good Openings. Costs being very low, this is likely to recover them easily.